NanoDays is an annual, nationwide festival of educational programs about nanoscale science and engineering and their impact on society. NanoDays events are organized by participants in the Nanoscale Informal Science Education Network and take place at science museums, research centers, and universities across the country from Puerto Rico to Hawaii. NanoDays engages people of all ages in learning about this emerging field of research, which holds the promise of developing revolutionary materials and technologies. 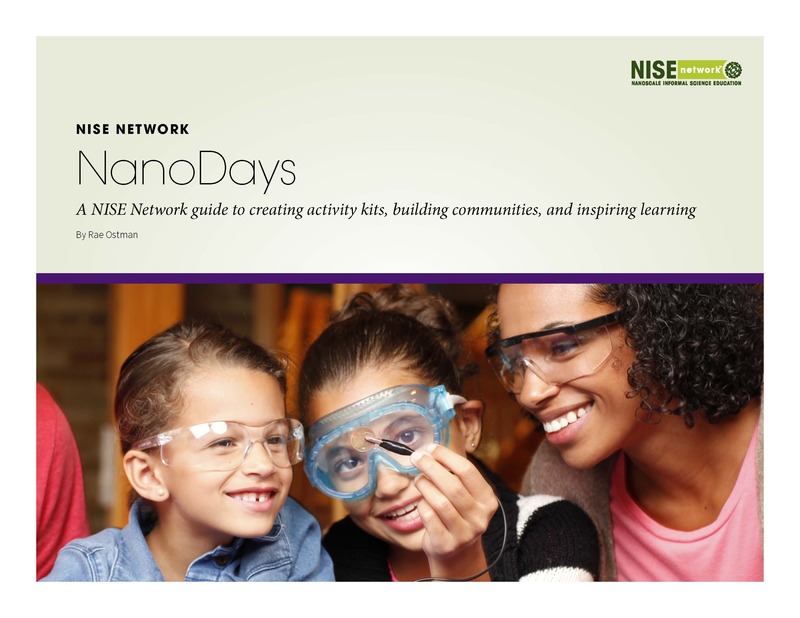 NISE Net is no longer creating new NanoDays resources. Digital versions of NanoDays materials are available to download. NanoDays activities can be used anytime throughout the year. Hundreds of organizations have hosted and participated in NanoDays events. We have a complete listing of physical NanoDays kit recipients from 2008-2015. Additional organizations participated by partnering with physical kit recipients or downloading and using the digital kit materials. What could YOU do for NanoDays? NanoDays events bring scientists together with museums and other informal education organizations, creating unique learning experiences. The resulting educational experiences engage people of all ages in a miniscule world where materials have special properties and new technologies have spectacular promise. Other NanoDays activities demonstrate different, unexpected properties of materials at the nanoscale, such as sand that doesn't get wet, tiny particles of gold that appear red in color, and water that won’t spill from a teacup. Some NanoDays participants host public forums, discussions about the risks and benefits of particular appllications of nanotechnology. Many participating universities host public tours of their laboratories that work with nanoscale science and technology. For lots of ideas about what you could do for NanoDays, please see the NanoDays planning guide. Alex Fiorentino, former NISE Net programs team member and Museum of Science Boston Education Associate, sent us this clip of his NanoDays song. Enjoy!